Bakers work in one of the largest, most dynamic and fastest growing sectors of the food and drink industry. Every day bakers make and sell millions of loaves of bread and baked goods, such as cakes, pies, pastries and biscuits to customers in the UK and around the world. Advanced bakers will have an in depth knowledge of bakery techniques and will demonstrate expertise in a range of bakery activities. They may work in craft, in store or in automated bakeries. They will have a full understanding of product costing and quality monitoring processes and will spend time working on activities such as product development and improvement. They will have both the knowledge and skills necessary to use problem solving techniques, quality assurance and Continuous Improvement (CI) techniques. They may be expected to lead others and will have skills in leadership and management. 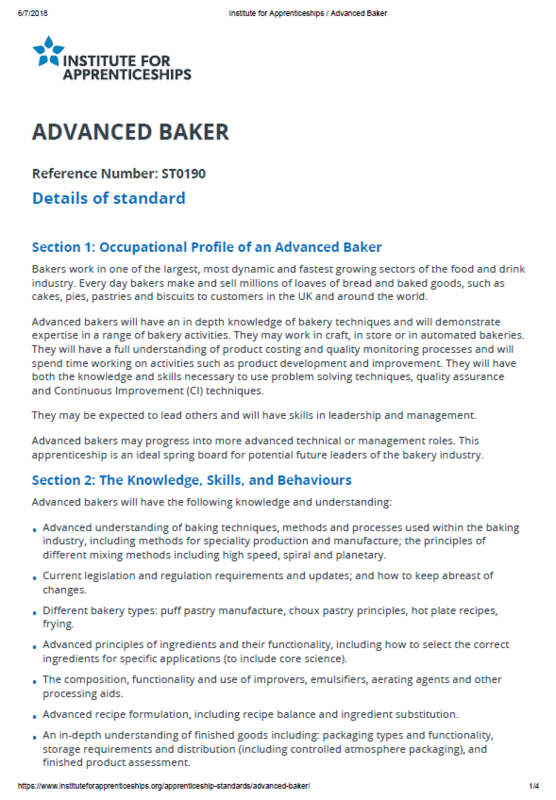 Advanced bakers may progress into more advanced technical or management roles. This apprenticeship is an ideal spring board for potential future leaders of the bakery industry.